Awami League general secretary Obaidul Quader categorically said on Saturday that the triennial conference of his party will be held in October. “Awami League triennial council won’t be held before its schedule time. It will be held in October,” he said. 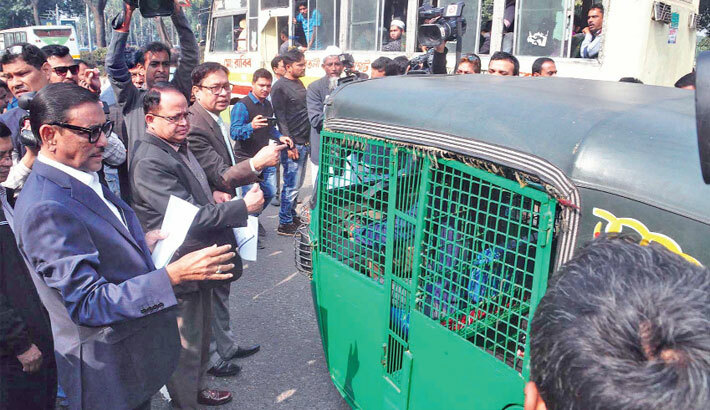 Quader, also road transport and bridges minister, was replying to a query of reporters while overseeing the mobile court operation of the Bangladesh Road Transport Authority in Manik Mia Avenue of the capital. Awami League’s 20th triennial council was held in October, 2016. The AL leader reiterated that there is no scope for dialogue over a fresh election under a nonpartisan caretaker government. “The democratic countries have extended their support to AL-led government. So, there is no need for holding any such dialogue,” he said terming it an unwanted demand. About bringing discipline on roads and highways, he said the BRTA will continue the mobile court drives in a bid to bring discipline on the roads. “The raids were suspended during polls season contributing to a rise in irregularities,” he said. Responding to a query, he said the people will have to change their attitude otherwise the mismanagement on the streets cannot be eradicated.